Correspondingly beautiful on both sides, our double face satin ribbon stands out with its cheerful, bold colors. Its sophisticated feel styles it a perfect choice for every event; together with any particular events. Celebrated for its high quality, you'll love to find that this ribbon is colorfast and offers reliable coloring from roll to roll. 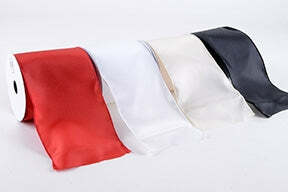 It is easily washable, and no steaming is essential, so it is stress-free to use it in fashion or any decor projects.